As I browsed the shelves of a local toy shop with my kids recently my daughter became rather animated and excited over something she saw. She had indeed. She knew everything about the toy from who made it, what came with it and she even knew the best way to ‘unbox it’. Apparently the way to sell toys now-a-days is to simply have Ryan from ‘Ryan’s toy reviews’ or Cookie Swirl C film themselves buying them, taking them out the packaging live and playing with them. Kids are hooked on channels like this and many others and it is changing life more than we may realise. Some of these channels are so popular they get more views in one day than well known TV shows. My daughter was delighted with her purchase and could not wait to get home and comment to her ‘virtual friend’ on her favourite channel that she too had the same toy now! As we drove home she chatted away about how The Engineering family had not reviewed her toy yet and maybe they would soon too but that Cookie Swirl C loved it and she had promised to make a new video of it this week. So what is my point in sharing all this: Well you may not know this but my daughter has autism. She finds communication and social interaction challenging. She is seen as different, she struggles with huge anxiety and leaving the house can be a massive challenge as transitions cause her so much stress. To see her excited in public and able to overcome her anxiety enough to be able to speak, to communicate so freely and connect with me, to see her interested in something other children also like; these are all magical to me. Autism and YouTube is a magical combination to my daughter and a magical combination to me too. My daughter is a visual learner and needs sensory stimuli to aid her learning. YouTube provides this so we use it to learn times tables, spelling, topic work for school and so much more. This way she is seeing, hearing, able to repeat parts over as often as needed to process, and she is in control by using her own tablet. It’s truly magical to see her finally understand something she could not grasp previously because she watched it on YouTube. When we have to go somewhere new or unfamiliar like ten pin bowling we can type into YouTube what we need and hear and see the experience before hand. It takes social stories to a whole new level! It prepares her for sensory experiences in advance and she is able to suggest having ear defenders in order to cope. This makes her feel safer and more in control and makes the whole family at ease. That’s amazing! When she struggles to know how to play with toys she can watch so many others (adults and children) play with play doh, playmobil, Thomas tank engine trains and so much more to learn ideas. While she may copy them she is still using the toys appropriately which is more than she was able to do before YouTube. That is magical. YouTube helps her make friends and connect with others in a way that nothing else has. While her friends watch different (more grown up) TV shows or attend social activities she can not cope with they totally understand and connect with her when she mentions things she has seen on YouTube. It’s like suddenly she speaks the same language as everyone else. That is special. When she struggles to sleep (common with autism) we can find some quiet soothing music on YouTube, when she finds food stressful we can find a video of kids in a bath of jelly to make her see food is not to be feared, and when we are going out we can use a visual countdown on YouTube to help her transition. If she likes YouTube then I will find ways to like it too. It is not just about nursery rhymes with Little Baby Bum or Stampy playing Minecraft, YouTube can be used to help autistic children (and adults) in so many ways. Oh and don’t forget that no matter how unusual their obsession may be there is most likely someone making YouTube videos all about that too! 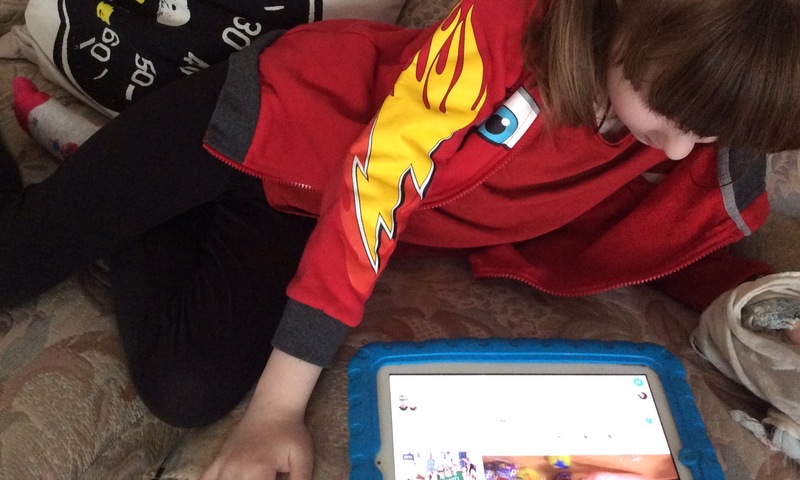 Is your autistic child addicted to YouTube? It doesn’t have to be all negative. Autism and YouTube can sometimes be the most magical combination ever! This entry was posted in autism, YouTube and tagged autism, girl with autism, obsession, positives, technology, useful, YouTube. Bookmark the permalink. My daughter is so much like this. She learns all the tricks of minecraft mods, Pokemon facts and so many other things from YouTube! She has asd, spd, PDA and finds it hard to socialise, she can manage to a degree but the overload is always huge. YouTube is her escape and it helps her relax and feel positive about herself. PanKwake finally began to at least try new foods after watching The Good Mythical Morning and their Will It shows. We have even had our own family version of Will It Taco. Surprisingly, brocolli and nutella both taco. But what surprises me is how informed some of the science shows are. One night when she was having trouble sleeping and I told her I was worried about her not getting enough sleep and maybe having a seizure. She informed me…Mommy, didn’t you know brown eyed people need two hours less sleep than blue eyed? I thought…yeah some silly YouTube. When I looked it up, there is actually a study from a legitimate university that does show that. We actually RadiCool Unschool…and YouTube is a MAJOR part of how she self-educates. Her life goal is to become a YouTuber. We have a few of them up so far…but loads more that I need to upload. Simple ones are not as hard as all that. Who knows maybe one day she will? Travel the world doing Crazzy extreme rides (mine is a sensory seeker) and promoting Autism. These two sound like sisters from another mother. We actually RadiCool Unschool…and YouTube is a MAJOR part of how she self-educates. She has learned ALL about ants and ant farming from AntsCanada. She used YouTube to help her decide that a bearded dragon was the best choice for her first lizard. And for us…I am proud of her LGBT acceptance. Thanks to people like Shane. PanKwake rarely watches TV…then only cartoons on Disney XD. But YouTube…that is another matter. This is the same for my son too he is also autistic and hates going out, he struggles going to school but you can see he really wants to interact with people but finds it so hard, his anxiety renders him mute. He watches families do challenges and do funny things together like play the flour tower game and we try to replicate these at home, it’s so wonderful to see him just blend in and interact with the rest of us . At the moment he enjoys watching the what’s inside you tubers who cut things open, and he will often randomly just come out with facts about things I never knew or thought to question. Another great one that really makes him laugh is the Dude perfect YouTube videos. He would be so happy if he could see them in action for real. They are very amusing. It’s great because we can really connect with my son by watching YouTube with him and recreating with him some of the things he sees on there. I have a non verbal son too and we can’t get him to use technology to communicate in the traditional way either. He uses YouTube and photos as well as Google Street Map and I am always amazed at how clever he is. My son has been obsessed with Hoover’s since he was very little and before he could walk. He used to love watching clips of people hoovering and could spend literally hours on You Tube. There was one particular clip of a boy unpacking a new Henry Hoover and Josh used to get so excited he would jump around the room. We had no idea then that he was autistic but looking back now it seems so obvious! He still loves clips on You Tube now he is ten and yes thinking about it he does learn a lot. What a fantastic idea to look at topics subjects on there, I will definitely be doing that now!! My grandson is 4 and austic loves to watch any kids videos learning or musical. It helped him learn his colors, shapes, count and helped learn more words while singing along. He has learned a lot from you tube. Hi. I was wondering if you could check out my blog? You don’t have to if you don’t want to. Oh, my names Mia. I have Autism. I was like her too. I hated going places but youtube always helped me. I struggled speaking to people but on youtube I would be in a world of my own. I watched some videos with more than one person in them and that helped me learn that you can’t go solo all the time. If you’re looking for any good youtuber for Autism then try Alex Lowry.